Would you trust your vacation, your education or a multimillion investment to a manga-style couple of blue-eyed kids with disproportional heads? Probably, you have to ask yourself this question before accepting those as a country’s advertising symbols. CFC Consulting, a Ukrainian company existing since early 2000s and mostly known for its political lobbying services has recently provided us with an extraordinary example of a complete marketing failure. Far from being the first attempt to “brand” Ukraine, the new concept really makes it worse: marketing professionals all over the world buy special glasses that avoid seeing this horror. The girl’s named Garniunya (which means, like, “beauty”) and the boy is Sprytko (“fast”) – not the names a western language speaker will remember that fast, while the concept, according to its creators, is focused on the foreign pubic. As usual, the crying problems such as pitiful execution of the character design (look at the flowers on the girl’s head – designer was really too annoyed to keep the details going) will not be considered of importance, as we are not here to judge the minor problems. We’re here to send a message to all of the marketers in the world: guys, please think before you do something and pay attention. And the coconut that the boy has on his head? 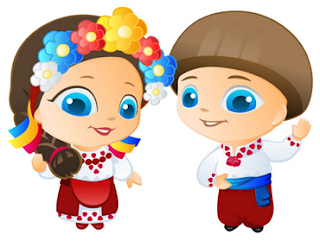 And look at the colors of his clothes – they have the colors of the Russian flag, while the Ukrainian one (blue-yellow) is nowhere to be found (OK, an attentive looker can see it in the colored ribbons on her head, but you have to be really determined). What is it, a kind of a hidden message? To discredit the country even more, there is a whole bunch of role models our two young friends incarnate. Sports- and businessmen, they are there to be your guides. A bit frightening, heh? And the eyes. Once you’ve seen them, you can not un-see them. Look once more at those guys, and now say to yourself: THIS is Ukraine. But I’ve reserved the worst part for the end. The most incredible part of this new “brand” is the fact that it also has a logo and a motto – supposedly, there is a huge marketing concept behind this. Working with Brandflight, one of the world’s leaders in the matter, we are somehow used to the existence of brand platforms, brand values etc., and usually there quite a clear system even if the execution is somehow weak (see the case of Strasbourg from the last week). When it comes to Ukraine, I am quite lost. The motto of the whole thing is “moving in the fast lane”. Already, it means literally nothing. Moving where? What is the fast lane and who else is in it? Is it good or bad, is it dangerous or maybe even illegal? No answer. Check the logo. It is a graphic design disaster. First of all, small caps. As we know from the typographic theory, this stuff is used when you need to show the difference between one phrase (or fragment) on the page from the others, for example, it can be used to draw attention to the opening phrase or line of a new section of text, or to provide an additional style in a dictionary entry where many parts must be typographically differentiated. Here, there is no page. But there are small caps, and it is just wrong. Then, you have this overheated and badly distributed ornament. There is no need in it, but OK, the guys took 100 000 dollars from the government to develop the whole thing (it’s the Ukrainian Foreign Ministry info), so they had to fill it with details (in my opinion, they would have done better to show this accuracy with the boy and the girl). The almost-melting “U” must be representing the friction – and thus the incredible speed of Ukraine… And here, my friends, we arrive and the point that is unbelievably incredible. Look at the cheap “motion” effect of the word “Ukraine”. Look at the “U”. Where do they go? To the LEFT. People in the West (as in Ukraine) write to the right. The logic of motion is to the right in the western civilization, and each and every marketing manual will tell you about the axes of so-called “emotion matrix”: up and right is good, left and down are for losers. Up and right. But Ukraine is going backwards. In the fast lane (the ridiculous detail is that the slogan is inclined to the right and thus going into the opposite direction from the keyword). With two strange guys that have – I would like to underline that – NOTHING in common at the level of branding or even on a visual level.